Proud Sponser of the Kelowna Futures Pro Tennis Stop in Kelowna! Back in 1998, the first one-week Futures Tournaments were launched. These tournaments had to be scheduled in a minimum of three consecutive weeks of $10,000 each or two consecutive weeks of $15,000 each in prize money, effectively replacing 65% of the Satellite Circuits that were being run. As a result, players were given far more opportunities to earn ranking points. In 1998, there were 212 Futures Tournaments offering a total of $2,635,000 in prize money. By 2004, a total of 356 Futures tournaments were played with a total of $4,150,000 in prize money, and the ITF Pro Circuit has only continued to grow by leaps and bounds ever since, including the addition of the City of Kelowna in 2012. 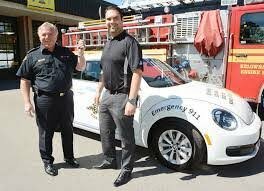 Extremly honoured and proud to be one of the community sponsors of the Kelowna Fire Dept for nearly 10 years! Look for the snazzy Turner VW Fire Bug at a community event today! 2015 marks the first year of our partnership with the Kelowna Falcons! And we are very excited! A great way to spend an evening in the heart of the Okanagan! Who knows, maybe you can win a brand new VW! Proud sponser of Noah Normandale and the 2017 United Way Bus Pull Challange! The BC Special Olympics provides individuals with intellectual disabilities opportunities to enrich their lives and celebrate personal achievement through positive sport experiences. Turner VW is so very proud to sponsor this amazing organization!